The Mid-Del Gentle Dental is conveniently located on S. Air Depot Boulevard, between Reno Avenue and SE 5th St just minutes from Tinker Air Force Base. We offer a flexible appointment schedule to meet your needs, including evenings and weekends. Our office accepts most dental insurance, and our friendly staff can help educate you on payment plans when needed. We also offer the Gentle Dental Smile Plan, which provides uninsured patients with reduced-cost access to most dental treatments. Our dental professionals offer a wide selection of general and specialized dentistry in a relaxed, calming environment. We have all your dental needs covered, including orthodontics, wisdom tooth extractions, dental implants, and endodontics. Ask about our affordable cosmetic dental procedures and enjoy the smile you’ve always wanted. As part of our mission to build lifelong relationships with our patients, we promise to always treat you with kindness, respect, and compassion. We believe gentle, open communication is key to helping patients reach affordable treatment goals, and will always keep you informed about your treatment options. Our office proudly supports our local air force base and offers dental care for their employees. Stop in to see us at our wheelchair-accessible office on Air Depot Boulevard. To set up an appointment or for further assistance, please call us at 619-202-1053. One of our friendly staff members will be happy to speak with you. Dr. Madamba’s vast experience allows him to expertly diagnose dental problems. He is experienced in Oral Surgery, Endodontics, Implants and Prosthodontics. He enjoys making a difference in peoples lives, whether it is easing a patients anxiety, taking them out of pain or improving their smile. His goal is to provide a caring, comfortable and superior dental treatment so that each visit is an outstanding dental experience. After graduating from Oklahoma State University, Dr. Madamba received his Dental Degree from the University of Missouri School of Dentistry. To keep abreast of cutting edge technology, he’s a member of many organizations including the American Dental Association and the Academy of General Dentistry. In his free time, Dr. Madamba enjoys sports and travel. Hadn't been to the dentist in a long while. They made it very easy. Paperwork and xrays went fairly swift as well. Awesome Dr. And the ladies in the hygienist section were awesome awesome awesome!!!! Now the whole family goes here. I def reccomend!!!!!!! I enjoyed my visit so much. The staff were all friendly and truly gentle. Anna Ray, we're happy you found our staff to be so supportive during your experience here at Gentle Dental Mid-Del City. WHAT CAN I SAY, IF I COULD GIVE THIS OFFICE MORE THAN 5 STARS, I WOULD!!!!! THEY ARE THE GREATEST AND NICEST PEOPLE. THEY MADE ME FEEL SOOOO COMFORTABLE!!!! I WILL NEVER GO ANYWHERE ELSE!!!!! IT'S GENTLE DENTAL FOR LIFE, FOR ME!!!!!!!!!!!!!!!!!! Dear Melanie Inocencio, Thank you for taking the time to post your kind words. At, Gentle Dental Mid-Del City, it means a lot to us to know you had a great experience and we look forward to seeing you on your next visit. I absolutely loved this place! the staff is so nice and as soon as you walk in you can just feel the friendly atmosphere the manager greets u in the chair and is more then willing to answer any questions you have even the hygienist I think mary was her name was very nice to and explained the cleaning I would need!! I definitely will be coming back ! and I would recommend any one to go there !!!! Saige Chavira, we are so happy to read such a great review about Gentle Dental Mid-Del City! Dr Brewer who I think looks like Dr McDreamy is the best! The staff are all wonderful 2! Thank you for all the effort you put in to making patients comfortable. I called them and they got me in within 20 minutes! I'm looking forward to this experience. Hi Felicia Mason-wright! We're so happy we were able to help you out! Very quick to the point, polite staff, loved the environment and amazing doctors. Thank you. Colton White, we are so happy to read such a great review about Gentle Dental Mid-Del City! Everyone was so great!!! Was able to get me and the kids teeth cleaned and a filling done for my son that we were not expecting to get done. The doctor was super friendly and the hygienist always had a smile on her face. The girls at the front we so warm and welcoming. Nathan Myers, your satisfaction is our top priority. This entire office rocks! When you first walk in you are greeted by Melanie who is fantastic at working with my personal schedule. Dr. Brewer and Leona are excellent at keeping me comfortable during my procedure. Mary was super sweet and gentle during my cleaning Hi jessica! Thanks for taking good care of me. You guys are awesome! Dear Robin Leverett, Thank you for taking the time to post your kind words about our staff. We are excited to share this with the team. At, Gentle Dental Mid-Del City, it means a lot to us to know you had a great experience and we look forward to seeing you on your next visit. Amazing Ortho staff! Dr. Rios, Ashley & My tech (Claudia), have been amazing from day one. They make you feel like family and not just a revolving door of transactions. I am always greeted with a personalized hello, nice to see you, how is (name or situation) going. Dr. Rios is friendly, explains your treatment and answers questions in a “patient friendly” manner. My last orthodontist was next, next, next...and while an in out approach is appreciated, it does nothing to build a patients confidence, comfort and trust. I am beyond satisfied with my treatment plan and the results. My previous Ortho created several gaps-I did not have prior to braces-and an overbite worse than before. I am not just paying for change, I see the change. Also, a few years ago, when we moved to the state, I brought my son in for an Ortho consult and Dr. Rios told us he wasn’t ready. She did not jump at the chance to take on an insurance patient and get paid-she told me to give him some time for baby/adult teeth to do what they needed and bring him back after for. I didn’t listen and took him somewhere else. We paid for phase I treatment and while we were satisfied with the results, they didn’t last. As his baby teeth fell out and permant teeth erupted, the results of phase I disappeared. We are now sure we will end up paying for phase II at some point. I don’t typically write reviews until a service or treatment is complete, but I’m confident and proud of my dental staff. My hygienist, Mrs. Mary, is also amazingly gentle (pun-intended). Stop by, don’t be shy and tell them I sent you. Dear Shaundra D, Thank you for the delightful feedback. At the Gentle Dental Mid-Del City, we are glad that the team has put you at ease and taken great care of you during your visit. Your review means a lot to us and we look forward to seeing you at your next visit. I am very satisfied. The staff is professional and friendly. Hi Charles Lovell, we are very happy to have provided you with such a positive experience! Very friendly staff, they explained everything fully and relieved my pain immediately.. thank you so much!! I will definitely recommend you ALL in the future! Hi Kelli Cooley, we are very happy to have provided you with such a positive experience! I’ve been going here for awhile now and everyone is great! Very friendly. Jessica Gill, we really appreciate your feedback! Dr Brewer is extremely knowledgeable. He went above and beyond to make sure everything went perfect! Definitely moving my family to the Mid Del office. Jennie Leibrock, we're so glad that we were able to go above and beyond your expectations! I feel like I'm around friends when I'm there. Very sweet. And chill. Not only that but they take care of you very well. I'd give them 10 stars if I could. Brooklyne Taylor Wetzel, we strive for 100% satisfaction, and it is great to see you had such a positive experience at Gentle Dental Mid-Del City. Lou L Davis-lampert, we're happy you found our staff to be so supportive during your experience here at Gentle Dental Mid-Del City. Dr Brewer and Staff are very good at what they do. Never had any issues with service given. Hi Sidney Buford, we are very happy to have provided you with such a positive experience! 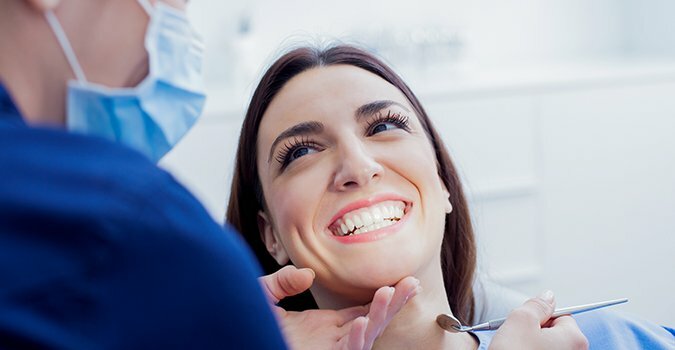 The best dental experience I have ever had! The ladies at the front were so sweet and willing to answer all my questions. The dental assistant was very nice and even got my weird humor. The Dentist was understanding of my fears of dental equipment and the hygienist gave me the best cleaning I have ever had. They are through and make it worth your money! Highly recommend. If you need a dentist that is understanding and very polite you need to come here. Dear Jasmine Walters, Thank you for the delightful feedback. At the Gentle Dental Mid-Del City, we are glad that the team has put you at ease and taken great care of you during your visit. Your review means a lot to us and we look forward to seeing you at your next visit. They are incredibly nice, they do a wonderful job, and they are so kind to understand and work with my financial situation. My dentist is always really nice and usually so are the girls that are there. (My most recent visit, they were all wonderful!) He definitely makes me feel like he cares about my teeth as well as my comfort (makes sure I'm. It in pain or when he works on my teeth he wants to make sure it feels right when he's finished). Amanda, we strive for 100% satisfaction, and it is great to see you had such a positive experience at Gentle Dental Mid-Del City.